Specification: Voltage: 110V±10%/220V±10%, 50HZ/60HZ Transfer Temperature: 180℃ Transfer Time: 180 Seconds Transfer Mug Size: 10OZ, 11OZ,15OZ, 17OZ Description: 1.Intelligent operation,high quality,double station,can transfer two mugs at a time. 2.Simple and beautiful appearance,smooth curved lines,arched base. 3.Four feet support,solid and fashion,the whole machine looks coordinating and artistic. 4.Quantitative counting,you can preset processing capacity when bulk processing,machine will warn you when arrives. 5.Easy to use,the handle bar is comfortable and smoothly. 6.Through lift and down on the handle will be able to finish the pick and place of the mug. 7.Intelligent temperature control,long service life. 8.Clean and close control panel,setting state clear buttons are flexible and comfortable. 9.Heat transfer image onto mug,make beautiful cup. 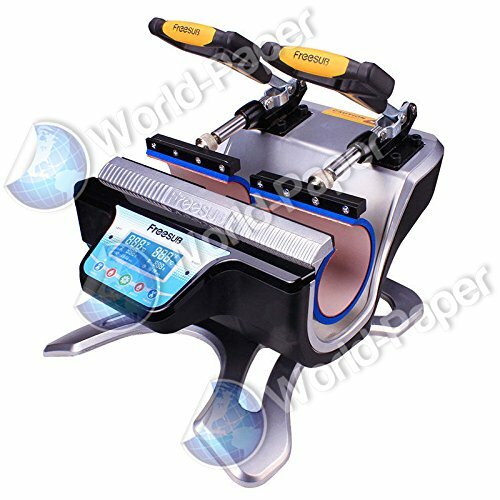 1.Intelligent operation,high quality,double station,can transfer two mugs at a time. 3.Four feet support,solid and fashion,the whole machine looks coordinating and artistic. 4.Quantitative counting,you can preset processing capacity when bulk processing,machine will warn you when arrives.